LAHORE: All Punjab Performing Artists Network (APPAN), the theatre practitioners from Pakistani as well as Indian Punjab, presented their first production Piro Preman, a real story of the first Punjabi poetess, at Alhamra Hall on Saturday. Directed by Kewal Dhaliwal of Manch Rangmanch from Amritsar, the story was written by Swarajbir, a deputy inspector general in Delhi. The cast belonged to the Ajoka Theatre Group in Pakistan. Preman is the story of a woman who seeks recognition as a poetess and is in search of a true love. Preman is a play about Piro, the first woman poet to write in the Punjabi language. Placed in the 19th century, she was born in a family of low origin in a village in Punjab. Not much is known about her parents and her early life. The play seeks to rebuild her life and times. The work is based on some well-known happenings in her life i.e. her being a poet, her living with Elahi Bukhsh, a general of Maharja Ranjeet Singh, her relationship with Gulab Dass, a poet and saint of the 19th century in Punjab and founder of the Gulab Dasi sect, and her death at Gulab Dass�s place. Other events in her life have been rebuilt and are fictional. 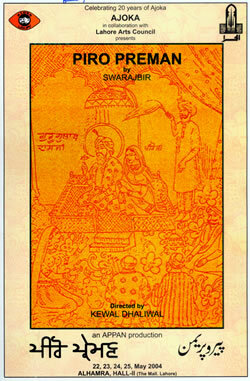 The play uses four original couplets of Piro and others have been penned by the playwright. The story goes. Sukhaan, a Mulsim girl of low caste, eloped with a flirt, a soldier in Maharaja Ranjeet Singh�s artillery commanded by his general Elahi Bukhsh. From the place of the soldier she reached the Haveli of the general, who asked her to give up poetry and marry him. The general goes for a war and she visits her family. On her way back to Lahore, she met a faith healer with whom she entered into a relationship in quest of peace of heart and mind. Bukhsh tried to get her back on his return from the battlefield. At that point, she met Gulab Dass who provided her shelter. He accepted her poetry and fell in love with her. Sukhaan too fell in love with him, an act she did for the third time in her life. However, Gulab Dass recognised her as a poetess and married her. The end of the play resembles a lot with the fates of Heer Ranjha and Romeo and Juliet. Piro is poisoned and Gulab Dass also committed suicide by taking the same poisonous milk. Music and poetry play a vital role in the play as it contained all the genres of Punjabi poetry - folk, Sufi, war, Heer, Shadhu or mystic poetry. The stage was nicely decorated with minimal props, which were lively and colourful. One of` the audience, a curator at Nairang Art Gallery, Nilofer Kaleem, found the play an �excellent production�. She appreciated the direction, production and acting in the play. �They have touched the sensitive issue skilfully. This is a play about the identity of a woman.� Marriam Ortt Saeed said, �I found the play a novel experience because it explored the paradox of being human in the most poetic and truthful way. It is especially commendable to understand the feminine aspect in such an integrated way. I feel plays like this can provide a basis for a change because they touch the emotions.� Ajoka�s Madiha Gauhar said another manifestation of APPAN�s work would be the publication of �Bullah� in Gurmukhi. They play has been published in Ludhiana and the book will be formally launched at the World Punjabi Conference to be held in Chandigarh in India this month.